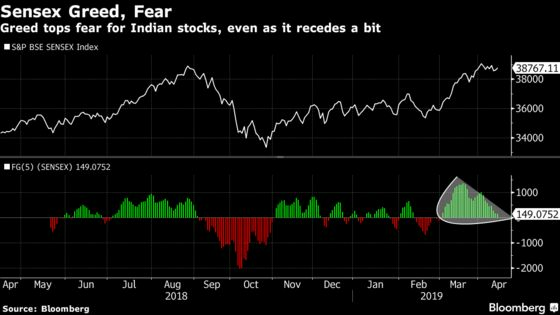 Indian equities rose, with key indexes rebounding from a weekly decline, on better-than-expected earnings at the nation’s biggest software exporter and a weather office outlook that predicted a near-normal rainfall this year. The benchmark S&P BSE Sensex gained 0.4 percent to 38,905.84 at the 3:30 p.m. close in Mumbai, more than recouping last week’s 0.2 percent decline, its first weekly drop in eight. The NSE Nifty 50 Index rose by the same magnitude. Tata Consultancy Services Ltd. -- or TCS -- reported a January to March net income that topped analyst estimates, while the India Meteorological Department said in a press conference 30 minutes before markets closed that rain in the June-September monsoon season is likely to be 96 percent of the long-term average. Demand in most of rural India gets a boost as normal rainfall boosts incomes and spending. “Indian markets had a rally in the past few weeks on the back of dovish central bankers and relentless buying from foreign investors, and at this juncture a lot depends on the earnings and elections for sustainability of these levels,” said Jagannadham Thunuguntla, senior vice president and head of research for wealth at Centrum Broking Pvt. in Mumbai. The crude oil price remains the biggest risk as any movement beyond $70 to $75 per barrel is not conducive for the Indian economy, he said. TCS climbed 4.9 percent to its highest close in more than six months after its fourth-quarter net income and revenue topped analyst estimates. Rival Infosys Ltd. dropped 2.7 percent, the most among Nifty stocks, as shares were downgraded at several brokerages including Nomura, Credit Suisse, Morgan Stanley and Citigroup, after the company issued a weak outlook. Sixteen of the 19 sector indexes compiled by BSE Ltd. gained, paced by a gauge of metal stocks. Twenty of the 31 Sensex members and 30 of the 50 Nifty companies advanced.